Are you ready for an upcoming vacation? Before embarking, you’ll need to equip yourself with the right gear. After all, you’re going to need something to hold all of your belongings. A good luggage will definitely do the trick. With the right Olympia luggage, you’ll be able to solve this problem in a heartbeat. Below, you’re going to find in-depth Olympia luggage reviews. Before that those, you’ll learn more about the company in general. Why You Should Choose Olympia Luggage? Olympia International was founded more than three decades ago. The company primarily manufactures and markets products dedicated to the every day traveler. The company focuses intently on providing the consumer with durable and dependable luggage. Over the years, Olympia has grown and expanded all around the world. Today, they have offices and production facilities in Shanghai, China. They also have research and development and sales office in Seoul, Korea. As someone who has been around the block a few times, I can tell you that Olympia is a name that can be trusted. One of the most notable perks of buying Olympia suitcases is the warranty. The company’s customer service department is based out of Torrance, California. When something goes wrong with your luggage, you can contact their Torrance office and they’ll work diligently to fix the problem right away. Just remember that the warranty does not cover damaged caused by accidents, wear and tear, or misuse. The warranty also depends on the product in question. For instance, some suitcases are covered for a few years, while others may have a longer warranty like Ricardo Beverly luggage. 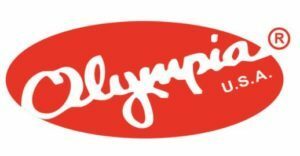 Nevertheless, Olympia is a brand that you can trust in this category. They always look after their customers! 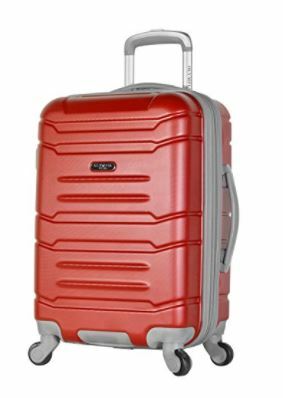 When scouring through Olympia USA luggage reviews, you will quickly discover that there is plenty to choose from. The Olympia USA luggage company manufactures a wide assortment of products ranging from totes to duffel bags. They even manufacture backpacks. No matter what you’re after, you can pretty much guarantee that Olympia will have something for you! To ensure that you make the right decision, it is always wise to read reviews for the product in question. When traveling, looking stylish is important, but not as important as the safety of your personal assets. If you are always concerned about the welfare of your belongings, when traveling locally or abroad, you should consider investing in the Olympia Lux 21” Carry-On Luggage. This piece is designed to ensure portability, durability and longevity. The craftsmanship of the luggage is superb, so you can rest assured that you are going to get your money’s worth from this investment. The Luxe Carry-On is designed from premium-grade products, including 100 percent polyester material. This material is designed to offer eye appeal and durability. You can also wipe the polyester exterior down with a damp cloth, when it becomes soiled. The innumerable zippers are also high quality, so you do not need to be concerned with malfunctioning. Each zipper has a large pull tag with the Olympia logo. Another brand logo is located on the smallest zippered pocket on the front of the luggage. These logos help identify the brand for authenticity purposes. The stitching is also superior and hidden from view. When others look at your Luxe Carry-On they will see nothing but perfection. The adjustable is not only ergonomically designed to provide immense comfort, but also is sturdy and durable. In fact, you can pull the luggage around, when it is completely filled with your personal belongings with ease and confidence. 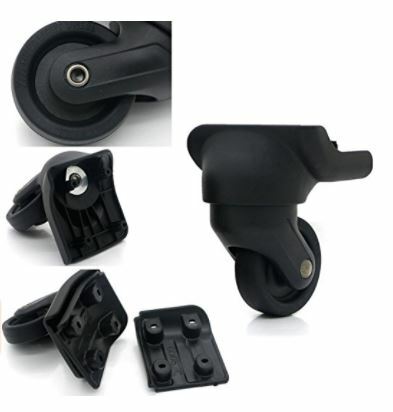 The handle will give you fill control over the luggage, even when rolling over the most uneven surfaces. The interior of the luggage is lined with a durable, beautifully designed fabric. In fact, the textile is so durable that you can wipe it down with a damp cloth, when it becomes soiled. The Olympia logo is located on the interior zippered pocket for authenticity purposes. There are also two straps to hold your attire in place during transportation. A clear plastic pocket is located on the interior front panel. The pocket is specifically designed to hold your perfumes and other beauty care products. The plastic will wipe clean, in the event it becomes soiled with residue from makeup. 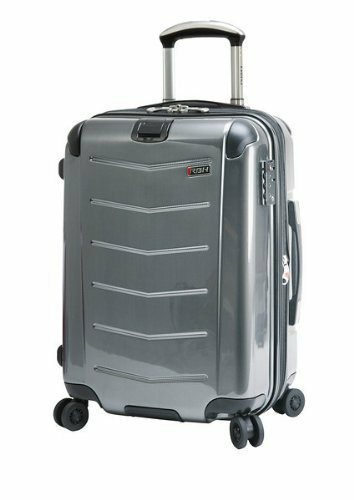 The Olympia Lux 21” Carry-On will make the perfect addition to your luggage. Each of the four corners on the lower portion of the luggage is covered with scuff protectors. As you already know, luggage can take a beating during transportation, especially airplane flights. With this said, the protectors will protect the exterior from smudges, scratches and scuffs. Airport traffic can be extremely hectic, plus you could end up spending hours in line waiting to reach the counter. The Olympia Tuscany Spinner Carry-On is designed to reduce your load and protect your personal belongings during these stressful times. With this said, the luggage will not only protect your back from strain, but also keep your assets safe and sound until you reach your destination. Unlike other materials, polyester can take a beating and continue to look vibrant and new. The Tuscany Spinner is designed from premium-grade polyester that is sewn together in a manner to keep the stitches hidden from view. To protect the material from scratches and scuffs, four plastic protectors are located on each of the four bottom corners. The durable four wheels are designed to ensure superior portability. In fact, the wheels will spin 360 degrees, so it will hand some of the sharpest corners and most uneven surfaces with ease. 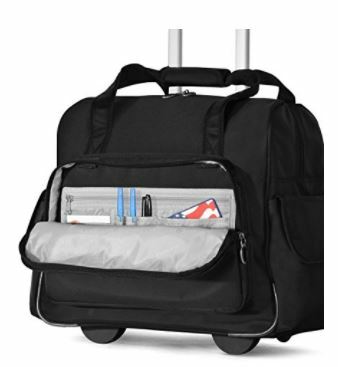 The Olympia Tuscany 21” Spinner Carry-On is idea for families and single. It is designed with premium components and its craftsmanship is superb for a very affordable carry-on. It also includes a bottle holder on the side exterior panel. This will give you immediate access to beverage bottles. Do you plan on staying away from home for several days? If so, you’re going to need to bring a lot of items with you. Investing in the Olympia Luggage 22” Rolling Duffel Bag is a wise decision. This bag is one of the cheapest on the market, but it is downright impressive in all categories. The bag is durable, lightweight and easy to move from one point to another. I can say for certain that it is one of the best Olympia suitcases on the planet. You’re going to find out why below! First and foremost, you should understand that this luggage is easy to move about. It is equipped with recessed in-like skates. This means that the bag can easily be moved from one spot to the other. At the same time, it includes a hideaway pull handle. This combination guarantees that you’ll have no trouble getting the bag from your car to the airplane. The Olympia 22” Pocket Duffel Bag is idea for overseas, school and local trips. The bag is designed in a similar manner as an upright luggage, but it includes so much more. The multiple pockets will ensure organization during your trips, plus it will give you quick access to your most prized possessions. Are you looking for the sleekest Olympia luggage on the planet? If so, I highly recommend checking out the Olympia Apache. This bag is available in five unique colors and they’re all gorgeous in their own way. And, it should be noted that appearance is only one of the benefits. This bag is also spacious, easy to transport, and very rugged. This bag will not disappoint, despite being incredibly affordable. Additional features will be explored in greater depth below. This luggage measures in at 9 by 14 by 21 inches. And, it should be known that it is 100% ABS. This material is one of the strongest. It is capable of taking a beating, without any troubles. On top of that, it will protect your items thoroughly. When you’re traveling abroad with the Olympia Apache, you’ll maintain your peace of mind! 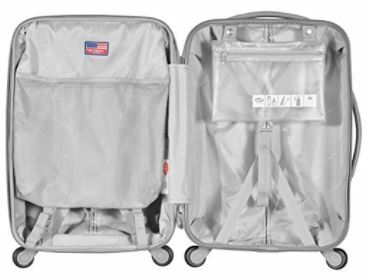 This luggage also features a hidden compartment. This is likely the most impressive feature of all. The hidden compartment allows you to access your items, without needing to open the luggage completely. You can just unzip the top, grab your laptop and zip it back. I’ve found that the hidden compartment makes life so much easier. You’ll love it too! Overall, the Olympia Apache is a great buy for most. It is one of the most affordable bags on the market. Nevertheless, it is still sleek, effective and easy to use. On top of that, it offers plenty of space for most travelers. For the price, it is easy to say that this luggage is a great bargain. Are you looking for a good Olympia luggage that can be carried onto the plane? 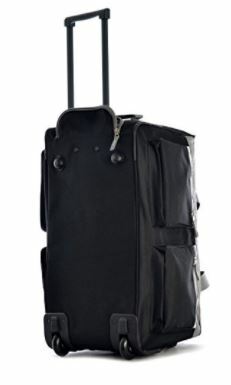 If you answered yes, I encourage you to check out the Olympia Denmark 21” Carry-on Spinner. There is ultimately a lot to like about this bag. It features a hard shell, so you can guarantee that all of your items will be protected from start to finish. It is also available in seven colors. This guarantees that it’ll look great every step of the way. Additional features will be explored in greater depth below. This Olympia luggage is unique in numerous ways. Nevertheless, it is the expandability that I feel really sets it apart from its competition. The middle of the luggage is made in a way that allows it to expand. This ensures that you’ll have an additional twenty percent capacity. While the luggage might be lightweight and compact, its expandability ensures you’ll have plenty of room for all of your items. You’ll definitely want to make sure that your investment is going to last. This is why I recommend you choose this luggage. It is manufactured using the highest quality ABS material. This material is rugged and incredibly tough. It will protect your items from start to finish. Plus, it’ll ensure that your money was well spent. I am confident that this luggage will last a lifetime. Despite having a few minor cons, the Olympia Denmark is still a good luggage. The zippers feel a little sticky at some points, but they have always worked great for me. I am confident that they’ll last. Plus, the luggage offers plenty of space for all of my items. That makes it worth the investment for most! If you’re going to be traveling on an airplane regularly, you’ll want to make sure that you have a carry-on luggage. 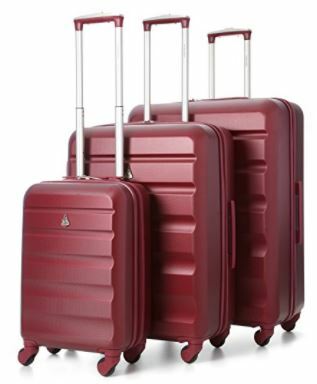 Look no further than Olympia’s Let’s Travel 2 Piece Luggage Set. This is one of my favorite sets, thanks to its versatility, sleekness and its affordability. These pieces are manufactured from the highest quality polyester. The rugger material ensures that the luggage will last a lifetime. Additional details will be provided below. Despite being a carry-on, this bag is still equipped with wheels and a handle. 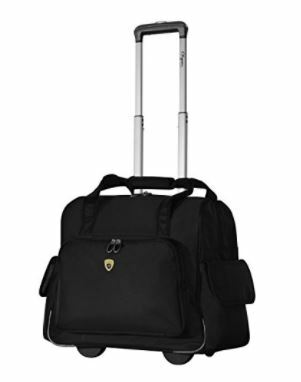 The in-line skate wheels guarantee that this luggage can be hauled around easily. It is also equipped with a push button retractable handle. Let me tell you. This is one of the easiest bags to move from spot to spot. You won’t break your back and you won’t break a sweat either! The Olympia Let’s Travel Set is definitely convenient, but it does have a few minor cons. The bag may not sit upright without assistance and the handle does feel a little flimsy. Nevertheless, I’ve used it for quite some time without any problems. Therefore, it should last. For the price, it is really hard to complain. When traveling abroad, there is a possibility that you’re only going to be gone for a few days. If this is the case, you’ll want to make sure that you do not overdo it. A bigger luggage might get in the way. 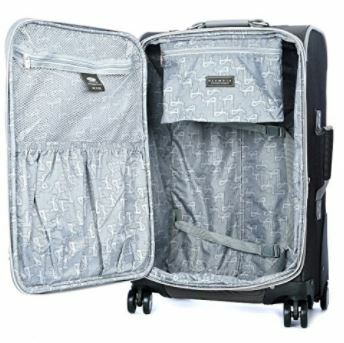 Instead, you should consider taking the Olympia Deluxe Fashion Rolling Overnighter along. This luggage measures in at 8.25 by 17 by 14 inches. It might be small, but it is fitted with a spacious main compartment. I’ve never had any trouble getting storing my items in this bag. It always holds enough for an overnight stay. There is a good chance that you’re going to travel with a laptop. I know that I always do. This is another reason that I appreciate the Deluxe Fashion Rolling Overnighter. This bag is equipped with a laptop compartment. This portion of the bag is heavily padded to ensure that your laptop is protected from start to finish. It is moderately sized, so it can be used for an iPad or a computer. Another great thing about this luggage is its portability. It is equipped with strong handles, so you’ll have no trouble moving it from location to location. 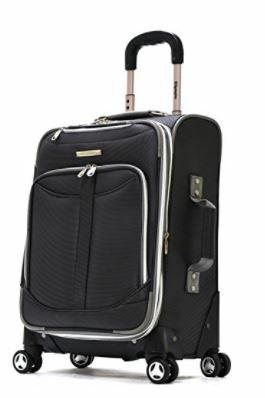 You can also use the extending handle to roll the luggage wherever you want it to go. 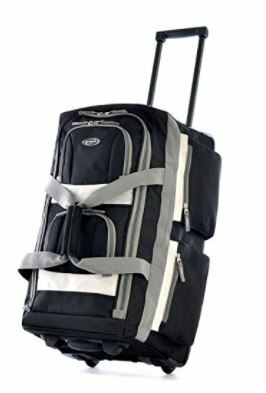 This luggage is beneficial for carrying books, nursing supplies or long-distance traveling. 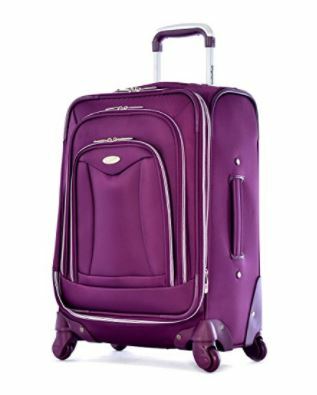 All in all, the Olympia Deluxe Fashion Rolling Overnighter is a great investment. It is affordable, sleek and more than capable of getting the job done right. Just remember that it might not be waterproof. Other than that, most people will love this luggage! 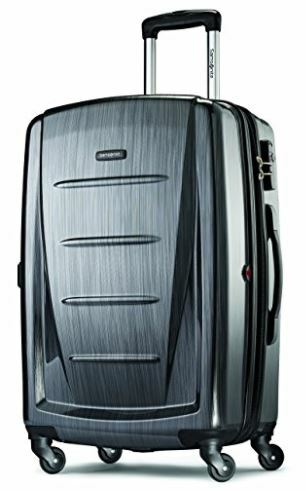 Ricardo Beverly Hills Luggage Reviews – Top List 2018 Samsonite Winfield 2 Review – Stylish and Affordable Best Aerolite Suitcase Review : Lightweight with Amazing Warranty Should You Go With Spinner Or In-line Wheels For Your Luggage?